Spelling has never been this much fun! Spelling has never been this much fun! Prepare for the big competition with Practice Mode; a special learning mode allows you to optionally choose if you want to briefly see the word on the screen prior to spelling it. Move up to Competition Mode - Play against family and friends to see who will take home the Spelling Bee trophy. See if you have what it takes to go to the top in this fun, game show style spelling bee in Game Show Mode. 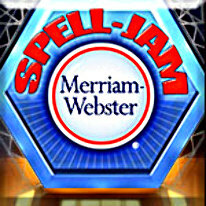 Whether you're trying to improve your word prowess or preparing to be the next Spelling Bee Champion, Merriam Webster's Spell-Jam has something for everyone!